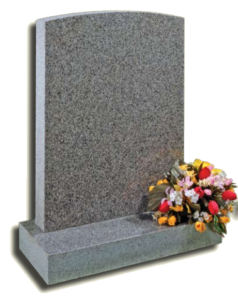 We are pleased to offer a comprehensive range of granite and marble memorials. Granite is renowned for retaining its beauty and for withstanding the severest weather due to its enduring properties. We realise that every memorial is special and we pride ourselves in offering a personal, friendly and understanding service. 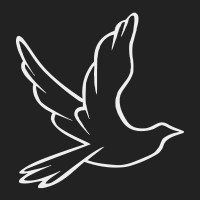 We will be pleased to advise you with regard to your choice of memorial and inscription details and will give you any help or assistance you require. Our aim is to ensure that you are completely happy with your choice and we will do our utmost to ease what we know is a difficult process. 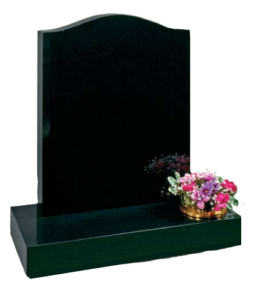 This memorial is one our all polished black granite range, which requires little in the way of maintenance. Due to the simple and plain nature of this headstone, this is an extremely popular choice. A slightly smaller light grey granite headstone with a polished face and sanded edges. There is a subtle curve to the top of the memorial which keeps it simple but pleasing to the eye.